The form template is the master version of your form. Creating a template is the first thing that you must do before you can start using any other GoFormz functionality. This document goes over the basic steps of creating a template, with links to more detailed articles about the various steps of the process. 1. 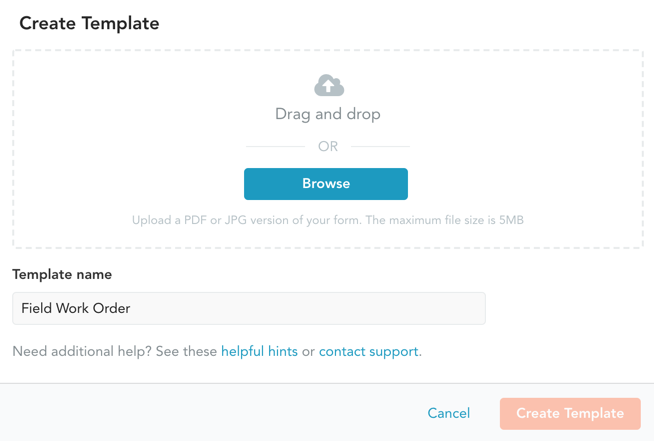 Upload a form PDF/JPG into your template. Template creation begins with uploading your paper form into GoFormz. To do this, navigate to the Templates Tab and click the Create Template button in the upper right to launch the Create Template dialog box. Enter the template’s name in the Template name field. Click Browseto select your PDF or JPG form from the file chooser, or just drag and drop the file into the box. Then click the Create Template button to complete the upload and create the template. Your new template will open in the Template Editor. See here for more on uploading your paper form into GoFormz. 2. Build your Form View. Now that you’ve uploaded your form, you have to tell GoFormz where on the form the fields are located, and what kind of fields they are. This is necessary in order to determine where on the form users will need to click or tap in order to fill out each individual field, and what kind of input control will show up once they do so. To do this, drag fields from the Template Fields panel on the left side of the Template Editor into the Template Builder area in the middle. Then resize and reposition your field to fit into the desired space on the form. 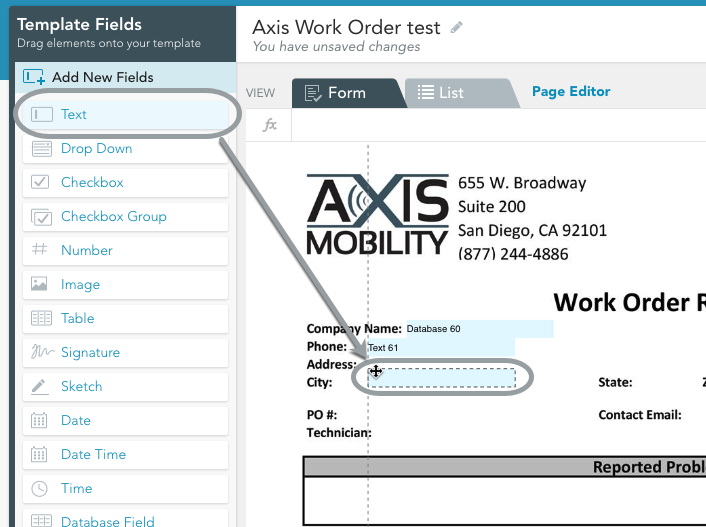 See here for more on building out your Form View. 3. Build your List View. The previous two steps built your template’s Form View by uploading a background image/PDF and overlaying it with GoFormz fields. Next, we build the List View, which is a different way of displaying the information in your form. It organizes your form fields into logically grouped sections and tabs for enhanced navigation on smaller screens. This view is completely independent from the Form View — you can choose to carefully build out your List View and have your Form View be secondary, or vice versa. See here for more on the difference between Form View and List View. To configure the List View, switch to the List tab in the Template Builder. Here, you can create tabs and sections and populate them with your form fields in the desired order via intuitive drag-and-drop actions. See here for more on building out your List View. 4. Set field properties. Click on a field in the Builder to see its properties in the Properties panel on the right. Then click on the various properties to edit them. Properties are split into Field Properties that govern a field’s functionality and metadata; and Display Properties that govern the field’s appearance and layout. 5. Save your template. Click the Save Changes button in the upper right corner of the Template Editor to save the template. Note that this is a necessary step, because the editor does not have auto-save! Once the template has been saved, you can access it in the Templates Tab.